Last Saturday as I walked the last mile from the S-Bahn station to the boathouse, I seemed to be alone on the path, but others emerged through the classic Berlin gloom and drizzle. An older woman with a long grey ponytail sailed down the hill on her bike. A blind man with a stick tapped his way along the sidewalk across the street from me, making slow but steady progress. All three of us were heading to the boathouse to row. I had noticed the blind man for the first time a few weeks ago, feeling his way along the wall up the stairs of the boathouse toward the men’s locker room. I was somewhat awed when I saw him; if I feel deaf and mute around Germans, it’s a temporary condition that can be remedied by a return to the land of English speakers. His condition has no such land of grace. The woman on her bike turned out to be Helga, the woman I had met on my first day at the club. She seems to be in her mid-70s and has rowed here since the club allowed women to join nearly 40 years ago. Her lined face and curved back may show the crush of age, but her eyes and wit are sharp and she is always ready to climb into a boat to cox or row. I saw a man leaving the dock after his row to carry his oars back to the boathouse. He looked damaged, lurching up the hill as if he had pulled a hamstring or otherwise injured his leg out on the water. But his gait looked familiar; it reminded me of the walk of a boy from my fourth grade class, pulling one leg behind him, the imprint of polio on his body. Dietmar came outside with his clipboard and I wondered if he would ask this gentleman if he was all right, but when he let the limping man pass without comment I knew this was no recent injury; this was the mark of some debilitating disease. It amazed me to think that this body that fails him on land allows him to fold himself into a shell and row. Earlier this year I had the chance to row in Melbourne, where I was visiting my sister. I had written to the club before my trip, asking if someone would be willing to take me out in a double while I was there. I received two replies. One of the women met me at the boathouse with a cane, but left it propped against the wall of the boathouse as we carried the double out to the dock for a row on the Yarra. Carol has multiple sclerosis. But that is not what defines her; she is an athlete first. Long before she was diagnosed, she was supposed to swim in the 1980 Moscow Olympics for Canada but her country boycotted them. Her Olympic dreams came to fruition later—after she’d been condemned to a wheelchair, after a series of extensive surgeries, after decades of training—when she won gold as a cyclist in the London 2012 Paralympics. We talked over coffee after our row, and Carol told me that most of the time her feet feel like they are on fire. They burn. The only thing that makes her forget the pain is intense exercise. I think of my friends back in Minneapolis, the legions of healthy rowers, certainly, but chance comments reveal health problems invasive and unpleasant—from cancers to surgeries to chronic conditions. Though someone may be missing for a few weeks, they each return to the boathouse as soon as their doctors give the go-ahead. Saturday, as I waited for the S-Bahn to take me home, along came a rower I recognized walking his bicycle to the train. He had been in my first row with Helga as cox. He was a man of few words who never seemed to smile, and I wasn’t sure I wanted to ride the train with him. But he struck up a conversation. He parked his bike in the aisle and sat across from me on the train bench. He turns out to be a little older than me, having moved to Berlin 30 years ago to study. He learned to row just last year. I told him I have three daughters and gave him the ages. He shared the same, and I was pleased to hear that he has a similar story to mine—three children, the oldest 15, but then he said they are 15, 14, and the youngest one died. Suddenly it felt as if the floor opened up beneath us and a huge chasm threatened to send me tumbling in after him. Such sorrow captured in those few words. It was enough to know his child died, that he carries such loss with him. I begin to think we all bring our broken selves to the boathouse. Whether it’s our blind eyes, our lame legs, our great sorrows, our loss for words, or merely the steady creep of age, we leave our troubles on the dock—our sneakers, our canes, our egos—and we row. 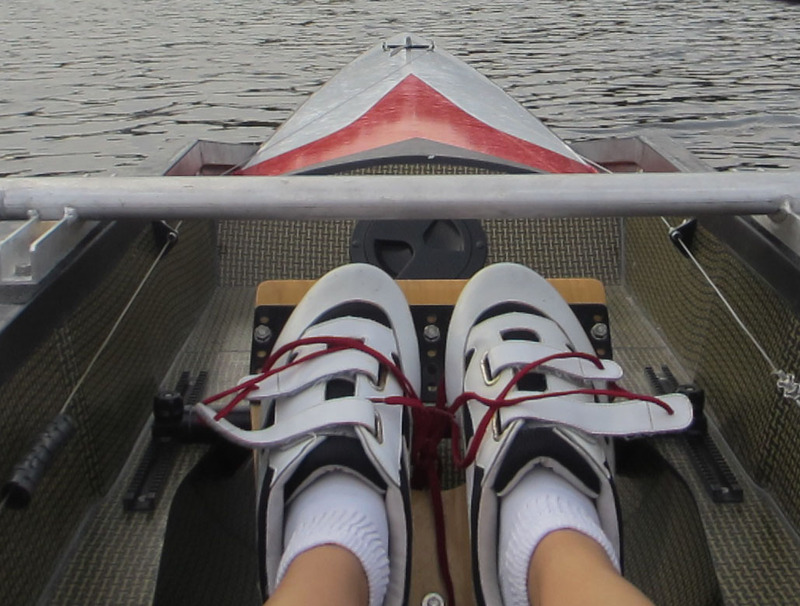 This entry was posted in Rowing and tagged Berlin, blind, cane, London 2012 Paralympics, polio, Rowing, S-Bahn on December 2, 2013 by Jill M.. I get the sense that for all of you, being out on the water and rowing is part of what keeps you going on, day after day. I like how calming being around the water can be. Styx did a wonderfully evocative song called “Boat on the River” that I think you would like — available on YouTube if you’ve never heard of it. I think you’re right. I often hear rowers talking about “needing” a row and that rings true for me as well. I don’t know the song you mention but I will look it up. Thanks for the comment.